Tyrone made a winning start to their McKenna Cup defence as they beat an Armagh side that finished with 12 men. Crowd congestion led to a delay and the 8,463 spectators saw early dismissals for Ciaran McKeever and Colm Cavanagh. Armagh led 0-6 to 0-5 at half-time and then moved three ahead before Aidan McCrory's goal levelled the game. Eugene McVerry's goal restored Armagh's lead but with Finian Moriarty and Aaron Findon dismissed, Tyrone hit the last five points to win 1-12 to 1-10. The start at the Athletic Grounds was delayed by nearly 30 minutes as around half the eventual attendance queued to watch Kieran McGeeney's first match in charge of the Orchard County. 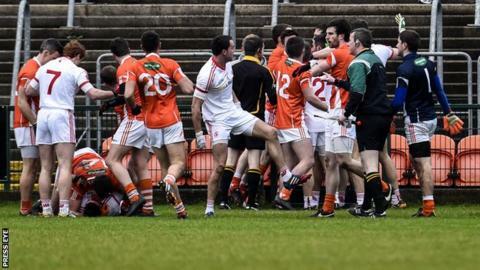 And the spectators witnessed a feisty first half, which was just eight minutes old when Tyrone's Colm Cavanagh and Armagh captain McKeever received straight red cards after several players have been involved in a melee. Sean Cavanagh hit four Tyrone points, but Micheal McKenna, Eugene McVerry and Gavin McParland were on target at the other end as the home side assumed control, going three points clear. Tyrone almost had a goal when Peter Hughes and Peter Harte combined to send debutant Padraig McNulty through, but he was denied by a superb Niall Geoghegan save. Tyrone 'keeper Niall Morgan was also called into action moments later, getting his angles just right to save from Mark Shields. Darren McCurry and Cavanagh were on target to narrow the gap, and at the break, it was Armagh who led by 0-6 to 0-5. Finian Moriarty and Aaron Findon were both sent off on second bookings, but Armagh led by three going into the final 10 minutes, after Eugene McVerry's goal had cancelled out an Aidan McCrory strike. The Red Hands, now with a two man advantage, struck the game's final five points, three of them from Darren McCurry, to take the points. In addition to the four red cards, 15 other cards were handed out in the Athletic Grounds encounter. In Sunday's other Section C match, CJ McGourty's late point earned Antrim a narrow 1-7 to 0-9 win over St Mary's University College at Creggan. James Lavery's goal in first-half injury-time put the Saffrons 1-3 to 0-3 ahead at the interval. St Mary's fought back to level after 48 minutes and a draw looked on the cards as the match entered its closing moments before McGourty's late free earned victory for the Saffrons, who were being managed for the first time in a competitive fixture by new boss Frank Fitzsimmons.